A search for the real Merlin – the historical figure at the root of the legend. The prime candidate is identified as a Celtic warrior who, after escaping from a terrible battle in AD 573, lived as a recluse in the wild forests of Southern Scotland. This book traces the history of the kingdom of Strathclyde in the era of the Vikings (ninth to eleventh centuries AD) when Govan was the main centre of royal power. 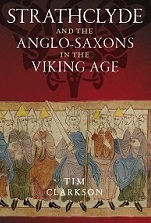 It highlights the kingdom’s dealings with the ambitious and powerful rulers of Anglo-Saxon England. 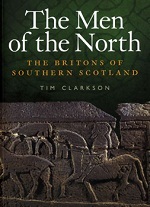 This is a history of the North Britons from Roman times to the Norman period. It tells the story of Strathclyde from the kingdom’s beginnings at Dumbarton Rock in the fifth century AD. 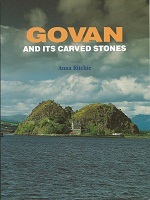 The image on the cover is from the Govan Sarcophagus. For more information about the contents click here. 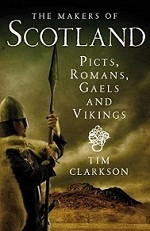 A narrative history of the Picts from Roman times to the end of the 9th century. For more information about this book click here. The Makers of Scotland: Picts, Romans, Gaels & Vikings. Available from Amazon UK and Amazon USA. A history of Scotland in the first millennium AD, from the eve of the Roman invasion to the age of Macbeth. For more information about this book click here. Columba. Available from Amazon UK and Amazon USA. A biography of Saint Columba (died AD 597) founder and first abbot of the monastery on Iona. For more information about this book click here.